Dance Preview: Local dancers keep Alvin Ailey’s spirit alive! AAADTs Jacqueline Green in Rennie Harris Lazarus. Photo by Paul Kolnik. More than any other major dance company, the world-famous Alvin Ailey American Dance Theater attracts an audience looking for a fun night on the town. These fans – who will no doubt be out in force for the company’s return to Baltimore’s Model Performing Arts Center April 23-24 – have been conditioned to expect upbeat choreography, a lively show and a rousing finale. When Alvin Ailey’s dancers appeared at the Kennedy Center last month, the first stop on its 60th anniversary tour, the opening night audience (decked out in black tie and sequins) had no intention of allowing the performance off stage without an encore. The troupe obliged with an effortless repeat of its signature number from “Revelations,” a tribute to Alvin Ailey’s African American heritage that has been performed at three US Presidential inaugurations – John F. Kennedy, Jimmy Carter and Bill Clinton – with a special dedication to Barack Obama at a 2009 Washington benefit. By now, you would think that Ailey dancers would be used to standing ovations. After all, for six decades, audiences have been cheering, clapping and demanding encore after encore from these famous dancers. Audiences never tire of it, and it always brings down the house, as it did the first time I reviewed Ailey’s company at Merriweather Post Pavilion in 1975. Ailey dancers know how to entertain, and they’re at their best strutting their stuff in “Revelations” and other dances designed to celebrate Alvin Ailey’s Texas roots, being a black man in the South, and church on a Sunday morning – all part of his heritage. While we lost Alvin 30 years ago, his legacy lives on, stronger than ever in some ways. Robert Battle now directs the Alvin Ailey Company with his associate Masazumi Chaya, one of my favorite Ailey dancers throughout his long career. 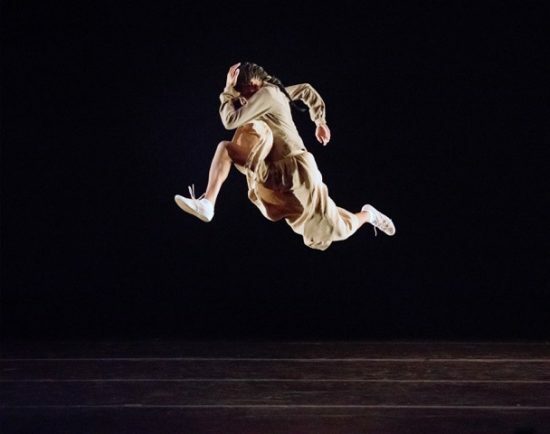 For the 60th anniversary, Battle commissioned a work to celebrate Ailey’s original vision for his company, and chose a well-respected Philadelphia hip-hop artist for the task. Rennie Harris grew up in the tough neighborhood of North Philly where he honed his street dancing skills into concert-producing venues around the world. Like Ailey, Harris discovered the cruel and unforgiving images of being black in today’s America. Both acts of “Lazarus” appear dark at first (intentional by designer James Clotfelter to bring us into the world of suffering and death). Still there are dazzling bright spots throughout the hour-long piece. The costumes by Mark Eric depict both joy and sorrow – much like a newer version of the dressed-for-church ladies in Alvin Ailey’s world. The choreography is called “GQ,” based on hip-hop, but for this writer, it reminds us of the fast footwork of Irish Step Dancing. I love the way the arms struggle to reach higher while the feet whip off steps that blur our vision. Another special moment takes place when Lazarus (or is he Ailey?) rises above the dancers lying on the stage, still moving their hands in a most unusual way. It’s difficult to single out dancers from the 15-member ensemble who change in each performance and who pop in and out in different roles. But the music and sound score produced by Darren Ross…well, that’s easy. Loved the spoken words throughout, and songs by Odetta and Nina Simone. Kudos to all involved in bringing his “Lazarus”to life here in Charm City. Opening night (which includes both “Lazarus” and “Revelations”) is my suggestion, especially if you are interested in celebrating both the past and what’s happening now in dance. Local fans should note the cast includes three Maryland stars to cheer in the upcoming shows. Daniel Harder (Bowie) is a graduate of the Ailey/Fordham BFA and a standout in the premiere cast of “Lazarus.” An Ailey II alumna, Courtney Celeste Spears (Baltimore) earned the Princess Grace Award prize in 2015 and made her debut with Company this past Lincoln Center season. And I, along with family and friends and students from School for the Arts, welcome Jacqueline Green back to her hometown. She has danced all over the world, tearing us up in “Cry,” making us smile as she carried that famous umbrella in “Wade in the Water. For me, though, it was her recent performance at the Kennedy Center that lingered long after the curtain closed. There are discounts to the performances, post-show party invitations and, hopefully, some master classes. For more information, call 410-900-1150 or email info@modell-lyric.com. Ailey Camp Baltimore at Towson University provides youth from the greater Baltimore area, between the ages of 11 and 13, the opportunity to explore their creativity, master their bodies and strengthen their respect for themselves and others can be found on Facebook. Carolyn Kelemen followed James Rouse's dream to Columbia in 1970 and has been writing about local artists for newspapers, magazines, and online ever since. She earned her MFA in dance at Mills College after a long career of performing on stage, in films, and on TV throughout the East Coast. Besides teaching dance at Goucher College and Howard Community College, she formed the Interfaith Housing Ballet Troupe at Slayton House and staged one of the New City's first dance benefits at Merriweather Post Pavilion. In 1999 she won a Howie Award for her support of the arts, and in 2006 she was inducted into the Howard County Women's Hall of Fame for her efforts on behalf of "Columbia Cares," a benefit for people living with HIV/AIDS. The 2017 benefit, "Dancing For Divas," honored Columbia women in the arts. She is the co=producer of "Razzle Dazzle" radio on the HCC Dragon Radio podcasts that showcases local artists. Carolyn is a member of the American Theater Critics Association and Dance Critics of America.